Biologists worried that an October hurricane in the Bahamas might have hurt the population, but 101 chicks were counted in southern Maine, about the same as last year – with a record 26 in Ogunquit alone. Maine beaches hosted at least 64 piping plover nests that yielded more than 100 fledged chicks this summer, a healthy showing despite initial concerns that a Caribbean hurricane might have killed some of the endangered birds. 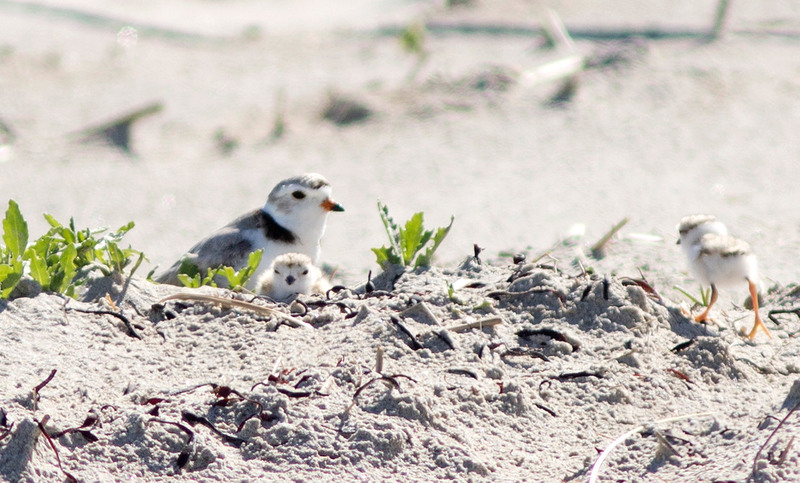 As of late last week, 101 piping plover chicks had taken flight or fledged from their nests on Maine beaches. While that is the same number as last summer and well short of the record 121 plover fledglings in 2015, there were still five or six late-bloomer chicks on beaches in Phippsburg that could take flight. Laura Minich Zitske, the piping plover and least tern coordinator for Maine Audubon, described 2017 as a solid year despite a small dip, from 66 to 64, in the number of nests after nearly a decade of steady growth. The 100-plus fledglings – the stage at which chicks can evade predators or other dangers on their own – means Maine is still meeting its conservation targets for gradually restoring a diminutive species of shorebird that nests on Maine’s relatively few sandy beaches at the height of the summer tourism season. It’s also been an unusually long nesting season for Maine’s plovers because storms wiped out some early nesting attempts. A total of 101 piping plover chicks emerged from nests on Maine beaches this summer, including these chicks in Ogunquit. “We lost a lot of nests, but most of them just tried again,” said Zitske, who works with the U.S. Fish and Wildlife Service, the Maine Department of Inland Fisheries and Wildlife, and volunteers to monitor plovers. At 7 inches long and weighing a mere 2 ounces as adults, piping plovers are tiny beachcombers that arrive in Maine in late-April or early-May to find suitable nesting locations in the sand or nearby dunes. They are found each spring and summer on roughly two dozen beaches in Maine, stretching from Ogunquit to Reid State Park in Georgetown. Plovers are listed as “threatened” under the federal Endangered Species Act and “endangered” in Maine because of a combination of habitat loss, past human hunting for their plummage and predation from other animals. Biologists recorded just six nests and seven fledglings on Maine beaches in 1983. There are an estimated 2,000 nesting pair of plovers along the Eastern seaboard. Unlike many other bird species, plover parents do not bring food back to the nest for chicks. Instead, the cottonball-sized chicks head out onto the beach, the mudflats or near the water line to forage for food almost immediately after hatching. Plover chicks are unable to fly for roughly four weeks after hatching, a time period that often coincides with humans’ favorite time to be on the beach. Yet one of Maine’s busier beach towns was responsible for roughly one-quarter of Maine’s total number of fledglings this year. The 26 plover chicks that took flight in Ogunquit this year is a record for Maine beaches, at least since record-keeping began in 1981. Like many other beaches, Ogunquit relies on a team of volunteers – about a dozen, in this case – who monitor for plover nests, watch for chicks and then urge beachgoers to be mindful of the tiny, easily spooked birds skittering about on the sand. Ogunquit also has a no-dogs policy on its beaches between April 1 and Sept. 8 to protect the plovers from harassment or harm. Volunteer monitors who see people with dogs on the beach will typically inform or remind owners of the policy. 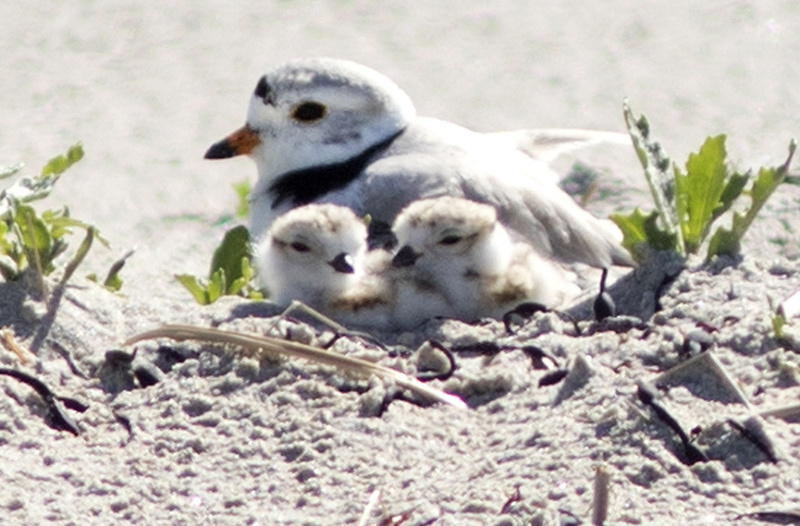 While plover-related beach policies remain controversial in some areas of the birds’ range, there have been no major flare-ups in Maine since Scarborough put additional restrictions on dogs after a chick was killed in 2013. Monitoring teams in Maine typically employ wire or other fencing material placed around plover nests as well as signs to advise the public about the birds. Zitske said Ogunquit’s success this year proves people and plovers can co-exist without major restrictions on beach access. “There are a lot of people there and a lot of people on the beach (in Ogunquit), but people are very respectful,” Zitske said. Plover numbers are climbing, but a storm last year highlighted the threats facing the species. After Hurricane Matthew hit the Caribbean in October, biologists expressed concerns about the fate of New England’s breeding population of plovers because many are believed to winter in the Bahamas. Anne Hecht, who oversees piping plover recovery for the U.S. Fish and Wildlife Service’s northeast region, said it may be some time before biologists can ascertain the impact. Monitors were watching for birds affixed with identifying leg bands in New England this summer, but that data has yet to be crunched. And the true scope may not be known until observers see how many birds return to the Bahamas this winter. “It’s going to be very close,” Hecht said.